The gluten-free community was buzzing a week ago when Domino’s announced their new gluten-free pizza. By buzzing, I mean swarm of angry killer bees. I pretty much lost all productivity once I read the press release. My blood was boiling. Then I popped when I read this next part. I’m not a doctor. I’m not a health expert. I’m just someone with a chronic illness managed by a simple diet change who happens to be educated and continues to stay educated. My late sensei would tell us in class all the time, “When you think you know it all, you know nothing.” This is why I keep reading. I know if I stop and feel like I know everything there is to know about Celiac and gluten intolerance, I really know nothing. I know that all of us dealing with gluten intolerance, Celiac or not, react to gluten. Our different diagnoses does not matter. It may do different things to our bodies. It may work silently. In the end, we all still react to gluten. It is a disservice in the press release that the attempt is made to try to say that the pizza is for those with mild gluten sensitivity. It is a disservice that Ms. Bast calls this pizza a “huge win.” There is no win when Domino’s is not changing their prep procedures to ensure there is no cross-contact occurring in the kitchens where the pizzas are made. My gluten-full friends were excited for me to have a new option. 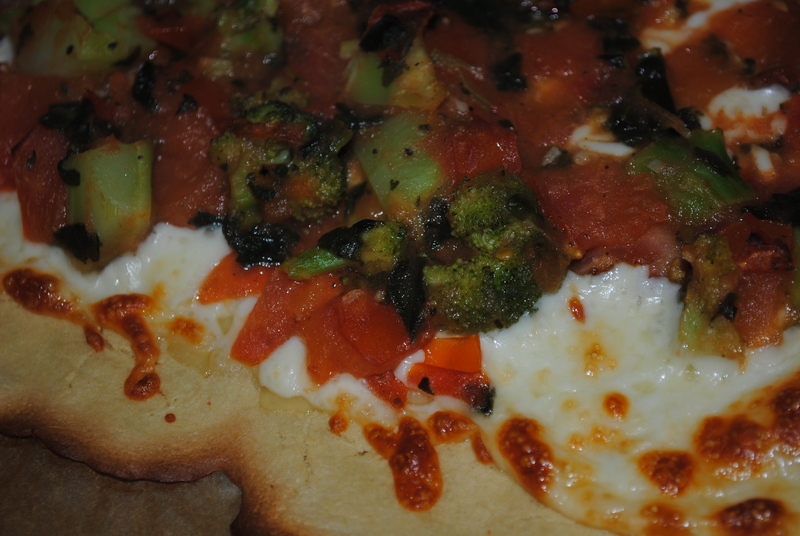 However, when I explained that only the ingredients are gluten-free, but the prep would be the same as regular pizzas, even they asked, “How can it truly be gluten-free?” I did not have to lead them to ask that question. They all asked it on their own. I either did a great job educating my friends or I have really smart friends. Or both. It amazes me that they, who are not living gluten-free, can come to this conclusion, yet a national food chain and a national foundation are praising this pizza knowing it not to be safe for all of us. Example: I was reading comments from people who already tried the pizza and said they had no reaction. Or saying the gluten-free person in their family has no reaction to cross-contact. This kind of mixed message marketing saying it’s okay for those with mild gluten sensitivity, but not those with Celiac, only feeds into the misconception that no reaction = no problem with the gluten present. It also does nothing to help those new to living gluten-free or those that do not stay educated on what gluten does to us. Or those living on the banks of Denial. If you listened to the Gluten-free Radio, hosted by Jules Gluten-Free, last week Thursday with Ms. Bast as the guest. I never realized how increasingly angry I could get over an hour. I shouted out a few things here and there. Chaz would walk into the room and just shake his head. I really can’t comment on specifics from the show or The Hulk might show up as I’m typing. Then all you’ll see before The Hulk hits “Publish” is IYLGFLJHFIGLUYO(YTgFHBKJAGSLGKJHSLGLSHG. We don’t want that, do we? However, Ms. Bast did point out that their involvement and their Amber designation was to clear up confusion. Yet, everything seems to get more and more confusing. Ms. Bast put out this statement last week about the NFCA involvement. She writes: “NFCA consulted with Domino’s on this launch and after reviewing operational procedures, we decided that we could not recommend this product for those with celiac disease. We urge those with non-celiac gluten sensitivity to exercise judgment in deciding whether to order this pizza.” Wait. Wasn’t she quoted in the Domino’s press release as saying this is a “huge win for the gluten-free community” earlier in the week? And shouldn’t she know that gluten is a problem for all of us regardless of diagnosis? One caller to the radio show pointed out that the NFCA’s involvement and Amber designation through their GREAT Kitchens program is seen by many in the gluten-free community as an endorsement of Domino’s and the gluten-free pizza. I agree with that caller. Think of a yellow light. There is a lot of gray area there. Proceed with caution. Slow down and stop. Gun it and go. Of course they mean for us to proceed with caution. But, everyone has their own interpretation of a yellow light. It frightens me that those new to the gluten-free diet or those who don’t stay educated would interpret the Amber as go for it. If the NFCA wants the gluten-free community to get anything from their GREAT Kitchens program, it needs to be clear cut. I tweeted, “I think NFCA should have a Red designation for their GREAT Kitchens program” while listening to Jules interview Ms. Bast. There is no gray area or question about red lights. You stop. Period. If a restaurant has gone to the NFCA because they want to offer gluten-free options for their guests, but will not change their operational procedures to ensure food safety for us, we shouldn’t be going near them. Plain and simple. Yes, these places know what they are doing and are ensuring food safety. No, they know what they should be doing but aren’t doing it. Dr. Alessio Fasano, Director of the Center for Celiac Research at University of Maryland, released a statement in regards to Domino’s gluten-free pizza which made it clear we shouldn’t be eating it. While the development of safe gluten-free products and safe dining establishments is always a welcome advance, we do not have the confidence that this product meets the safety standards we recommend for our patients. The introduction of cross contamination from a large chain like Domino’s represents a threat to our patients affected by gluten-related disorders, including celiac disease, gluten sensitivity, dermatitis herpetiformis (a skin condition), wheat allergy and gluten ataxia. As an international celiac research center with expertise in gluten-related disorders, we believe that individuals who have been diagnosed with a gluten-related disorder should NOT consume this product. Everyone gets to make their own choices in what they eat, even when it comes to living a life with food allergies/intolerances. If you have contemplated the Domino’s gluten-free pizza, I urge you to not try it. Chuck E. Cheese is working on bringing their new gluten-free pizza to the market, but is currently only available in some Minnesota locations. Naked Pizza also has a gluten-free pizza option and they are a company that uses sustainable resources as much as possible. If you are in agreement about the NFCA’s Amber designation, 1 in 133 started a petition to get rid of it. Please sign it and show your support! *Note: If you are in the restaurant industry and want to provide a safe gluten-free or even allergy-free experience for diners in your establishment, the NFCA is not the only resource. Allergy Chefs, Inc. has a training sessions conducted by Chef Joel Schaefer. Chef Joel and his wife worked for Walt Disney World Resort for many years and they are the persons to thank for Disney bringing allergy-free dining experience for us. Chef Joel is the one from whom I picked up the term “cross-contact.” As he says, cross-contamination refers to bacteria that can be killed. You can’t kill foods that are allergens. This entry was tagged Allergy Chefs, Celiac, Chuck E. Cheese, Domino's, gluten intolerance, gluten sensitivity, Gluten-free pizza, Gluten-free Radio, Inc., Naked Pizza, NFCA. Bookmark the permalink. Thanks for sharing your opinions, now that you’ve had a chance to keep “The Hulk” in check. 😉 The more people we reach about this, the better. Education and awareness is key! Then, while I agree with you that they shouldn’t eat it, those that must follow a gluten-free diet can make informed decisions about what to eat/not eat. Great post, Debi. I wrote Dominos offering our help…NO ANSWER! It’s embarrassing how those look at this as an opportunity to scam those with dietary allergies or intolerances for the sake of earnings. We sell on average 300 pies a week and do everything to prevent cross contamination. We also sell allergen free chicken, calzones, fries AND HOT HOAGIES. If they really cared, they would fix the problems. Steve, I applaud you for your efforts! It sounds like your allergen-free options are a big hit. Not everyone can say that they do allergen free calzones and hot hoagies! Sadly, I’m pretty sure they don’t care or they would have done a better job. From a comment I read on another person’s FB, they did this down in Australia, too. I wanted to mention it in the blog post, but I didn’t have verification. The way they’ve handled it here makes me want to believe it. Thanks Much! We didn’t launch our products until we could control the cross contamination as best as possible. My 10yo son eats our stuff about 3 times a week and if I trust it for my own kid….that’s safer for my customers. Like I say when I do presentations around the northeast, this isnt like offering low carb wraps. You either get it…or you’re not doing it for the right reasons. Yes, if they cared they would’ve done it right! While seeing all of the negative publicity on this, I am happy that ALL of the news is getting out. Do you know why Dominos use prep tables with the wire grates? SO THAT THEY CAN TAKE WHAT FALLS THROUGH THE GRATES AND PLACE BACK INTO THE TOPPING BINS FOR REUSE! WPXI here in Pittsburgh did a segment on GF and led off with Dominos….he made the pizza on a contaminated table!!!!!!!!!! Us, WE NEVER LAY THE PIZZA DOWN! I had no idea their prep tables had wire grates. So glad I haven’t had their pizza in over a decade (by choice first). You are right. Too many establishments want to jump on the bandwagon like non-Celiac/gluten intolerant people because it’s the newest “thing” thanks to Hollywood. My first friend that was dx with Celiac years before I knew gluten was a problem for me just posted on FB that she can’t wait for gf being treated and viewed as a “fad diet” to be over. My hope is that when the hype is over, people will see gf diet for what it really is, a medical necessity to maintain optimum health for those of us with Celiac and non-Celiac gluten intolerance. Go to my Facebook Facebook.com/mandyspizza and look my link to the story and watch Dominos prep the pizza. They shouldn’t have done the interview without consulting corp since it only reinforces the bad publicity. Look, they don’t affect my business since our customers trust us. But we care about our customers and this is embarrassing to our efforts. I don’t think the national corporations really understand that gluten-free people are brand loyal. Once we find something we really like, we stick with it even if we try other things. Not that losing business from gf people will make a big dent in their bottom line. I’m just glad that there are chains out there that recognize the necessity of the diet and making sure there is minimal risk of cross-contact. If I’m ever in Pittsburgh, I’m coming to Mandy’s! You’ve done a great job with this post, Debi! I’m right there with you and probably would have been with The Hulk, too. LOL But all said I’m glad you kept him in check. 😉 Thanks so much for sharing your thoughts. I’m still surprised at how many there are who have not heard about The Great Pizza Debacle, but those of us in the online gluten-free community “live and breathe” such news and many of our readers do not. So it’s really important for each of us to share this info with our readers, both to protect them and to let them know they, too, can take action and voice their opinion through the petition (many voices are louder! ), emailing/calling the NFCA, and emailing Domino’s. Just have to say that Kitchens with Confidence was out training restaurants today both live in a class and on our on line webinar portal. We do this almost every single day, full time to teach the industry about all special needs of diners in the areas for GF and Allergens. AllerTrain, KwC certified class is much more then a book/ workbook and ome tools you can purchase. It is clear as a bell for information, direction and certified training. Approved by the former ADA now known as the Academy of Nutrition and Dietetics, the ACF American Culinary Foundation. Recently our AllerTrain K12 class was certified by the School Nutrition Association. Bottom line, others have looked under our hood and say yes, it is the real deal. We just started posting on AllergyEats what restaurants we have trained with tons of chains setting up private classes for their entire group/managers/chefs in the next few months. Check us out. Thank you, Betsy! I had not heard of Kitchens With Confidence before. Glad to hear you are part of AllergyEats. I was actually using that the other day when we were in Louisville and we were trying to figure out where to go for dinner. We were living there when I went gf, but haven’t been there in over a year. Great resource. I love that you have certified and NOT. It’s really how it should be. Just like processed packaged foods. They are either certified gf or not. No maybes. No proceed at your own risk. I’ll be keeping an eye out on your efforts! Thanks for your encouragement. You would be shocked at the brands we are getting ready to launch but my lips need to say sealed until we are finished. This pizza debacle is crazy on so many levels. We have done huge chains, mom and pop locations, a great pizza chain out of New Mexico, many many more to come. Makes me really sick that this clear ploy for $ and press will lead to harming so many. Irresponsible on many levels IMHO. Jump into an AllerTrain class to see what we do and had I know I could have sent you to a great little cafe in Louisville. Lynns Paradise Cafe- Patty She is fully trained and certified in Allergens and Gluten Free. I understand the lips sealed thing. My husband does contract work and his client right now, it’s all research and development, so he can’t say a word until they launch each project. Can’t wait to see what you’ve been working on.